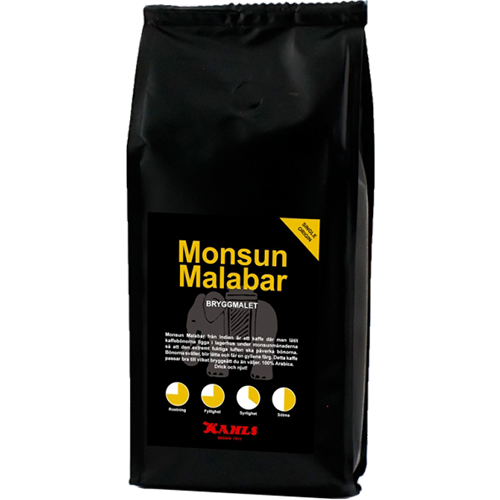 Kahls Monsun Malabar ground coffee is a unique coffee from the city of Mangalore on the Malabar coast in western India. A coffee with a taste to mimic the taste of the coffee that was poured in Europe in the 18th century, when the coffee was transported over the sea in wooden hulls. During the long journey to Europe, the coffee was affected by the damp air in the cargo spaces of these wooden vessels, which gave the coffee a special taste. To recreate this special taste, the coffee is monsooned in open warehouses during the monsoon period, when moist air from the Indian Ocean penetrates the Malabar coast. Monsooning means that the coffee beans are spread out into the open warehouses, where the monsoon winds are allowed to do its job with almost 90% humidity. The coffee is scrubbed daily and after 3-5 days the coffee is put in bags where it may swell. After another 3 days, the coffee is spread out on the ground again, where it stays for a further 3-5 days. The process continues until the beans get a smooth, almost ivory-like color when they are dried and packed. Kahls has chosen to roast this coffee really dark to get a powerful taste with an almost syrupy feeling. The acidity is low and you can expect a taste of caramel and whiskey.